Powerful tabletop units in a class of their own. 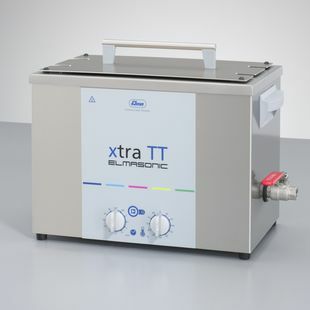 Elmasonic xtra TT tabletop ultrasonic devices are designed for use in production environments, workshops and servicing. All functions and cleaning parameters like time and heating preselection and ultrasonic frequency are arranged user-friendly on the control panel on the front of the device where users can set and monitor them at a glance. Permanently integrated Sweep function for uniform distribution of the ultrasonic effect in the entire ultrasonic bath. Switchable Dynamic function increases the peak ultrasonic performance. This improves the effectivity of cleaning and makes it possible to remove even the most stubborn contaminants. Individually settable limit temperature with LED warning indicator on reaching the temperatur. Sensitive parts like jewellery or plastic parts are handled gently. Clearly arranged, control unit that is protected from spraying water. the ultrasound starts automatically when the preselected temperature is reached. With their ultrasonic performance of 37 kHz, Elmasonic xtra TT devices are rated for continuous heavy-duty operation. The tanks are made of special stainless steel, which makes them robust with a long service life. If they are used in single-shift operation, they are guaranteed for three years.